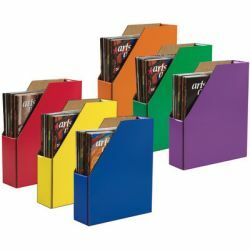 Store and display your magazines with these durable corrugated holders. The coated finish helps protect them during daily use. Colors in assorted include: Red, Yellow, Blue, Orange, Green and Purple. Recycled and recyclable. Set of 6.